A large statue of a Wapiti surrounded by Autumn colored leaves makes its self known at Parc Omega in Montebello, Quebec. As the leaves change with the seasons, the statue of a Wapiti, showing off his antlers, stands beneath the trees at the entrance to Parc Omega in Montebello, Quebec. A statue that is just the beginning of an amazing adventure that takes you through a wildlife paradise. 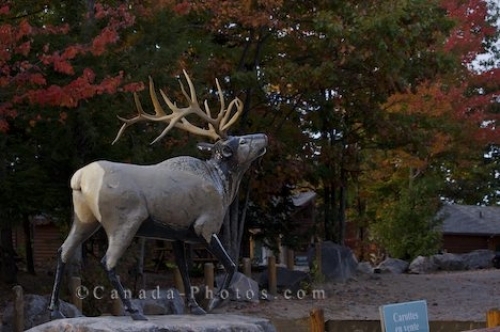 Statue of a Wapiti at the entrance to Parc Omega in Montebello, Outaouais, Quebec, Canada. Picture of a statue of a Wapiti near the entranceway to Parc Omega in Montebello, Outaouais in Quebec, Canada.